Sean Doherty of LTN writes about Gartner’s 2013 Magic Quadrant for E-Discovery Software report, identifying kCura as a part of the ’Leaders’ quadrant. NBC 5 Chicago highlights local tech companies who are ramping up recruitment and mentions kCura’s plan to hire more than 100 team members in 2013. Chris Dale of the eDisclosure Information Project writes about the recent release of Relativity 8, in addition to highlighting kCura’s latest white paper and Miller Canfield’s recent licensing of Relativity. Complex Discovery discusses Gartner’s 2013 Magic Quadrant for E-Discovery Software report, naming kCura among the list of vendors. 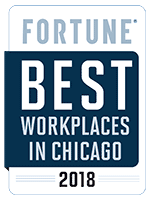 kCura is listed as one of Chicago’s Best and Brightest Companies to Work For in 2013, which recognizes a commitment to excellence and innovation in employee relations. KMWorld Magazine highlights enhancements to Relativity 8, including performance improvements and updates to Analytics, Assisted Review, and Processing. Crain’s Chicago profiles kCura founder and CEO, Andrew Sieja, highlighting the company’s history and Andrew’s leadership in helping kCura become one of Chicago’s largest software companies. On April 4, early-bird registration for our fourth-annual user conference will open. Taking place from October 6-8, Relativity Fest 2013 will offer Relativity users unique panel discussions, hands-on labs, breakout sessions, and insight from the kCura team and other users. kCura was recently presented with a Gold Stevie for “Customer Service Department of the Year – Computer Software” at the seventh-annual Stevie Awards for Sales and Customer Service. kCura’s client services team was recognized for their focus on providing high-touch and reliable support for Relativity users. Additionally, our sales team was awarded two Silver Stevies in the “Sales Growth Achievement of the Year” and “Sales Department of the Year – Computer Hardware & Software” categories. Our live “Ask the Doctor” webinar with Dr. David Grossman and Jay Leib will take place on Thursday, February 28, less than one week away. Dr. Grossman will discuss how statistical validation plays a key role in computer-assisted review. The short presentation will be followed by interactive Q&A. Relativity Certified Administrators and Relativity Certified Sales Professionals can earn 4 RCE credits by attending the webinar. Credits will count toward the renewal of their certifications. Kiersted Systems, a Relativity Premium Hosting Partner founded in 1984, today announced that they have earned Relativity Best in Service recognition from kCura. Following an extensive audit, the award recognizes their commitment to infrastructure, customer service, and product expertise. kCura is excited to participate in the 8th Annual Information Governance and eDisclosure Summit in London on 14-16 May at the Lancaster London Hotel. Contact us to set up a meeting to learn about the latest features of Relativity or see a product demo. In anticipation of next week’s Techweek conference, kCura lists five ways attendees can benefit by attending the dev_summit. Lighthouse eDiscovery, a Relativity Premium Hosting Partner based in Seattle, today announced that they have earned Relativity Best in Service recognition from kCura. This award follows an extensive evaluation of Lighthouse’s technical infrastructure, customer service, and Relativity expertise. kCura today announced the release of Relativity Binders, a free iPad app designed for partner-level attorneys who need quick and secure access to important case documents at any time.